You might already know that Indians eat their food with hands instead of fancy cutlery. Eating food with hands might be looked down upon in some cultures, but to me, there is nothing more satisfying than rolling up homemade Indian chapati and dipping it into spicy curry with bare hands. Or eating soft, white basmati rice covered in gravy and licking off every last bit of grain. May be its being Indian, that my favorite food group is finger foods. Food that can be just picked with hands conjures up scenes of snack times with my sisters and family, sitting in a circle talking about our day at school, giggling away on little random happenings of the day and going over the options for dinner. I served this chat masala spiced potato wedges with lamb kebab sliders with coriander mint mayo. But I have made them twice ever since just on its own as finger food. They are addictive, lightly spicy and a burst of flavors in every bite. Chat masala is tangy Indian spice mix extensively used for snacks, fruits, yogurt, and drinks and sometimes in curries. It’s not only used as a flavoring but also used to garnish or add finishing touches to dishes. 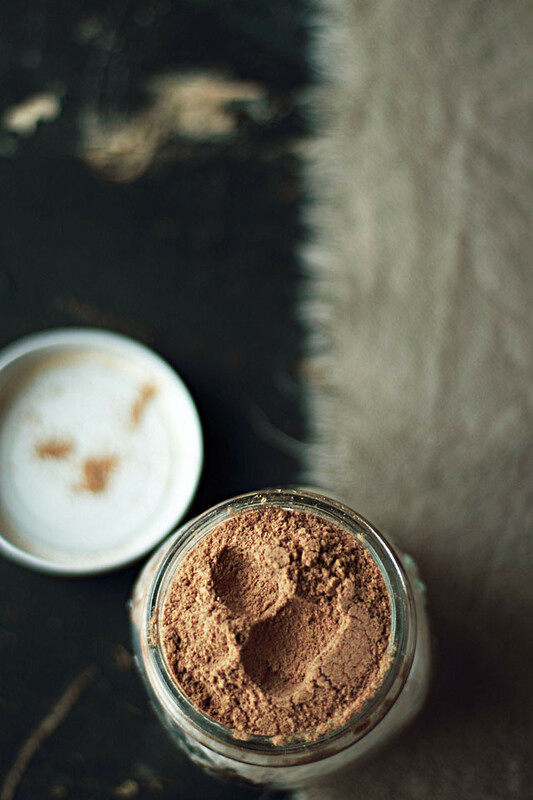 Apart from spices like cardamom, red chilies, black pepper and cloves, what makes this spice mix stand apart is the use of black salt (Kala namak) and dry mango powder (aamchur powder). The black salt has a characteristically pungent smell and taste which adds a unique depth of flavor whereas the dry mango powder gives it an acidic and tart flavor. The salty, tangy, hot and sour characteristics of spice mix provide a melody of flavors in each bite, leaving a tangling effect on your tongue. 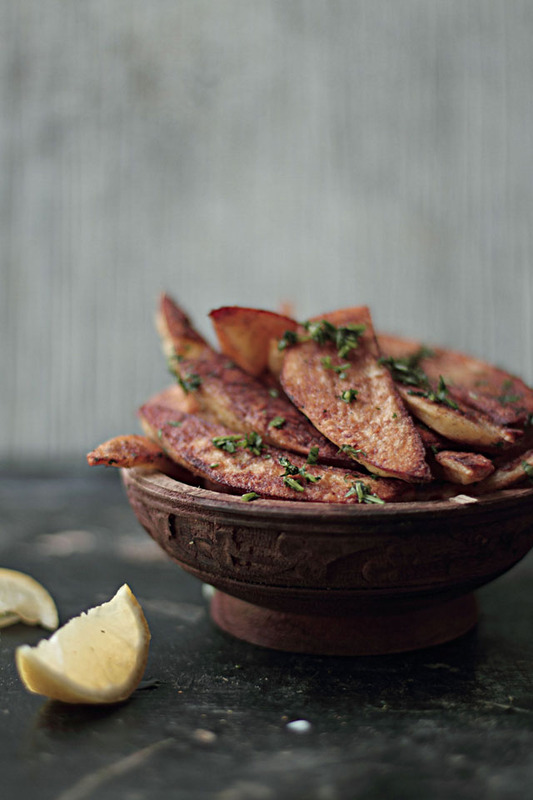 The finely chopped coriander leaves perk up and add a refreshing bite to these wedges. Besides, there is something about the green herbs on your food, that just screams eat me! I'm sharing this recipe on my dear friend Xiaolu's blog 6 Bittersweets. You might remember how I sang poems about her when she was guest posting on my blog, and let me tell you, she is everything that and much more. She is such a great spirited, talented, honest and kind person and it all shines through her wonderful blog. I hope you shall join me and show some love! What a great idea - they look yum! 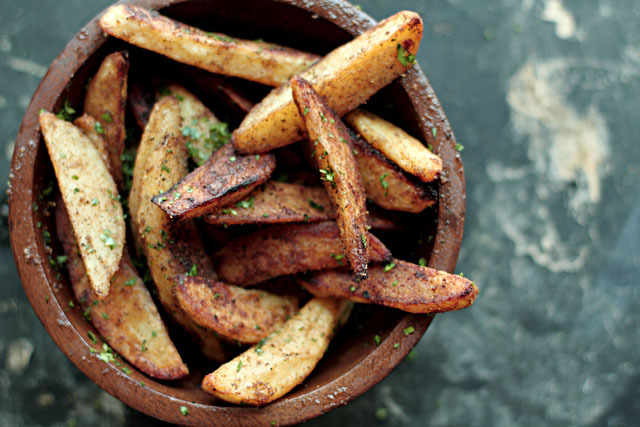 Those potato wedges look marvelous! Yummy. I just love your potato wedges. This is such a classic recipe to me and delicious as well. Love this post. those pictures are making plain old potatoes look so much yummier! Nice! I read chaat masala and salivated..with aloo- yummo!!! Love your baked version sweetheart - will be tried soon! These look so delicious. I will check out 6 Bittersweets asap. That. Is. So. Gorgeous. I. Need. To. Sit. Down. I'm totally with you, nothing like digging into food with your hands. That too when the food has kala namak and amchur mixed in...sounds crazy, but I could literally smell the chatpatta kala namak-chaat masala smell while reading your post! I'll blame it on the photos...I think they're making me hallucinate. I've been waiting for you to post this recipe. It looks delicious Kulsum and I can't wait to try it myself. Love chaaat massala! Amazing picture and oh my this pictures makes anyone eat even they are picky :) Gorgeous, Love ur shots always. 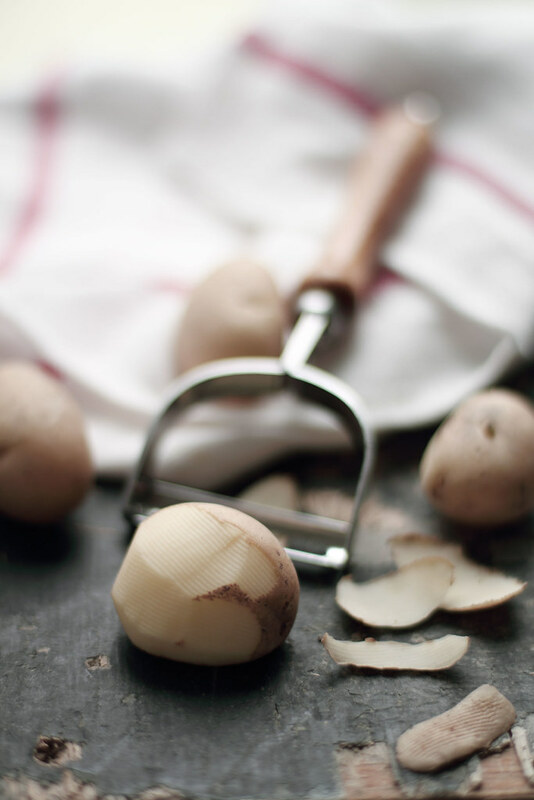 The recipe is definitely an ace but what always intrigues me are your gorgeous photos! Your posts always put a smile on my face my friend :-) Keep up the good work! Oh yum! It's like Indian french fries. I'd love to have some of these with some green chutney. Finger food are my fav too. And I really do not know what is there to look down at eating food with hands. Food react better when touched! Baked potatoes are such a treat .. takes minimum of your time to prep and I can enjoy without any calorie guilt. I'm currently very much into Indian food. I've always loved it but for some reason it keeps popping up everywhere lately and I cannot resist! This is another fabulous looking recipe I will have to try! I saw these over on Xiaolu's blog and fell head-over-heels in love! Looks lovely! Well done on the guest post! 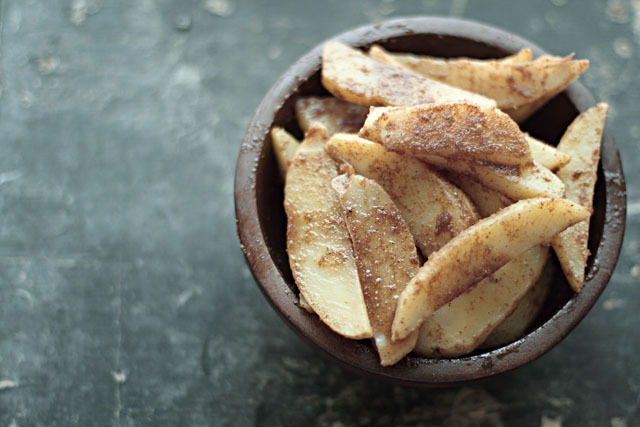 mmm there's something about homemade wedges that are just so more-ish and I can't wait to read your guest post of at 6bittersweets - I love her blog! Absolutely stunning photos Kulsum!!!! I love how crispy those wedges look. Yum!